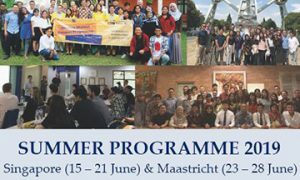 The EU Centre, together with its partners in the Jean Monnet Network on Challenges to Multiculturalism and Multilateralism, are organising a 2-week Summer Programme in Singapore and Maastricht in June 2019 to introduce students to the Association of Southeast Asian Nations (ASEAN) and the European Union (EU). Anyone interested is welcome to contact Thomas Christiansen by 1 April. The Summer Programme (from 15 – 29 June) will provide an opportunity to learn more about the EU and ASEAN, looking at their institutions, norms, and policies, and examine the roles they play in their respective regions and globally. The first week of the Summer Programme from 15 – 21 June will be held at the National University of Singapore. Participants will get to learn about ASEAN, go on educational and cultural excursions, and have dialogue with ASEAN ambassadors and experts. From Singapore, participants will then travel to Maastricht and spend a week from 23 – 28 June at the Maastricht University to discuss with academics and policy experts the key issues confronting the EU. Also included in the programme are visits to the EU institutions and other cultural excursions.